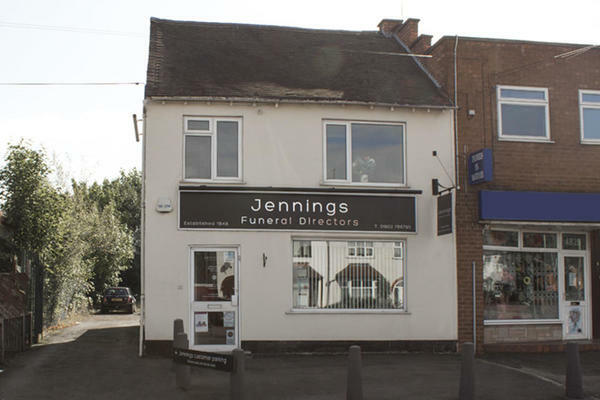 At Jennings Funeral Directors in Wolverhampton, we believe that life with those we love is deeply personal. A funeral service should be no different, which is why we endeavour to give every person in our local community a fitting and meaningful farewell. We work closely with the families in our care, giving our full support as well as any advice or guidance. We want to ensure that your loved one receives a funeral service that reflects their life. Whatever kind of funeral you have in mind for your loved one, we will be able to help arrange it. You can reach us 24 hours a day, so whenever you need our help our dedicated funeral professionals will be on hand to support you. Call us today on 01902 786795 to talk through your personal requirements. There is private parking at the rear of the funeral home, and on-street parking at the front. Our staff are available 24 hours a day on 01902 786795 if you require our services outside of these hours. I was very happy with the service provided by both the office staff - when arranging the funeral and the staff on the day. Our wishes were adhered to and staff were professional throughout. On the day, we felt confident that we would be supported and guided and did not have to worry about anything. Wonderful service provided with excellent customer care and friendly professional service, everything went to plan and they even did things I forgot about which made the day perfect, would definitely recommend to everyone I know to help in the difficult times of death, thanks for all your time and help.